One of our regular readers, Cracktown! USA, left a comment not too long ago inquiring about the local watering holes in the Warrendale neighborhood. I thought about it for a bit and have decided to launch a new feature on the Warrendale Blog: Cool Warrendale Thing of the Week. Every Wednesday I will feature something about the Warrendale neighborhood that I think is just plain cool. It might be a local watering hole, eatery or a unique example of architecture in the area. Whatever it is that I happen to think is cool. The opinions are purely subjective and they are totally mine. I just thought that this would be a good opportunity for us to showcase a few things about the neighborhood for folks who either haven't been here at all or who have been away for awhile. (Believe it or not, this blog has received visitors from as far away as Helsinki, Finland). Anyway, without further ado, I give you the Cool Warrendale Thing of the Week for October 12, 2006. 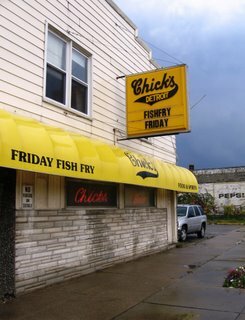 Chick's Bar has been welcoming thirsty Warrendale residents and visitors alike for so long that no one really remembers them not doing it. I'm not 100% certain of this, but I am fairly confident that there was an earlier version of Chick's Bar at that location when Cadillac's expedition landed in Detroit way back in July of 1701. It is the quintessential neighborhood tavern. The sort of place where you feel right at home from the moment you walk through its door, whether the place you call "home" is around the corner or - dare I say it - in Helsinki, Finland. There is almost always a game playing on one of their TVs. The beer is always cold at Chick's Bar. The chairs are always comfortable and - miracle of all miracles - every one of the bartenders at Chick's Bar instinctively knows the ideal ratio of Jack Daniel's to Coca-Cola whenever I happen to walk in. If the folks in Stockholm were to start giving away Nobel Prizes for Bartending, Chick's Bar would surely be one of the top contenders. Until that happens, however, they will have to content with merely being named Cool Warrendale Thing of the Week. I came across your blog while looking up information on Warrendale for a class project. I love the cool thing of the week idea. Can you tell me when and where the Warrendale Community Organization meetings are held. Are they open to Detroit residents who live outside Warrendale? Anon, do you happen to go to U of M? just curious. Anyway, needless to say that i LOVE chicks, been going there since i was in the 6th grade. The fish fridays are the best in town. Gota love that perch eh?